Newsweek did something very different lately. Instead of just having a reporter write about abortion, they had the reporter actually go and watch abortions being performed. Sarah Kliff’s story about the conflicting emotions that she felt while witnessing an abortion and while talking with the patients at an abortion clinic is very revealing. It is very obvious from the article that Kliff is “pro-choice”, but she was surprisingly candid when describing her emotions and the emotions of the patients in the waiting room…..
Kliff’s description of what she saw when she witnessed an abortion sounds both clinical and more than a bit depressing at the same time…..
A first-trimester abortion, from my vantage point behind the glass window, looked like an extended, more invasive version of a standard ob-gyn exam. A woman with her heels in stirrups, clothes traded in for a hospital gown, a speculum holding the cervix open. Carhart used a suction tube to empty the contents of the uterus; it took no longer than three minutes. The suction machine made a slight rumbling sound, a pinkish fluid flowed through the tube, and, faster than I’d expected, it was over. Even though she is clearly pro-abortion, Kliff acknowledged at the end of the article that Americans clearly feel more uneasy about abortion than about any other “medical procedure”…..
Americans may support abortion rights, but even 40 years after Roe, we don’t talk about it like other medical procedures. The reality is that what both Kliff and the patients she encountered in the abortion clinic waiting room experienced was a feeling that what was going on there was very, very wrong. That is because what was going on in that abortion clinic was unspeakably evil. Even though the reporter and everyone in that abortion clinic has been programmed for decades to believe that there is absolutely nothing wrong with abortion, their consciences still were there, relentlessly gnawing at their hearts and minds. When you get right down to it, even though their hearts have been very hardened by sin, the American people still know that abortion is wrong. The truth is that the American abortion industry has slaughtered over 40 millions babies since the Roe v. Wade decision of 1973. But sadly, instead of repenting and turning away from abortion, America seems to have less respect for life than ever. Activists on both sides of the abortion debate were shocked recently over revelations that the owner of one Florida abortion clinic actually put a baby born alive into a plastic biohazard bag and threw it out as garbage. 18 year old Sycloria Williams had visited an abortion clinic just outside of Miami, Florida and had paid over one thousand dollars for Dr. Pierre Jean-Jacque Renelique to end her 23 week pregnancy. But Williams actually gave birth to her child before the doctor could perform an abortion. What happened next should shock you to your core. What happened next is that one of the owners of the abortion clinic cut the umbilical cord, put the living, breathing baby into a plastic bag and threw it out with the garbage. Police were eventually able to discover the decomposing remains of the baby in a cardboard box a week later after receiving an anonymous tip. According to the department of health in that area, when doctors performed an autopsy on the dead baby they were able to determine that the baby actually had filled her lungs with air. That means that that the baby had been born alive and was breathing. There are reports of babies left to die in back rooms of abortion clinics all over the Internet. 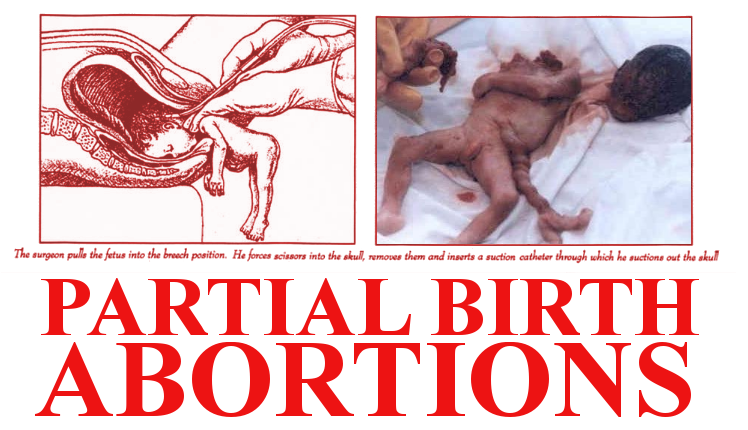 It seems that abortion “doctors” have no trouble snuffing out life even if the mother is 9 months pregnant, even if babies survive the abortion procedure or even if babies are born alive before the doctors can perform the abortion. As we drive around in our fancy cars and we relax tonight in our Mcmansions, the truth is that thousands of babies are being killed around the nation today. It is estimated that there will be about 1.2 million abortions performed around the United States this year. Perhaps you have had an abortion. Perhaps you have even performed an abortion. The truth is that if you have had an abortion or if you have performed an abortion, you have sinned greatly. But there IS forgiveness available.